The buildings tell a story. It’s only when you’re close to one that you see the shell and bullet marks in the walls. Then, there are the plaques on public buildings. These tell you when the building was restored. Sarajevo has a lot of these plaques. The restorers have done a remarkable job. From a distance, nothing appears to be amiss. Sarajevo is a case of east meets west. Sitting in a coffee house with a cappuccino, you could be in Vienna. Stroll around the market and you might be in Istanbul. Sarajevo essentially comes in two parts; the old town, built by the Ottomans and the more modern city centre, built under Austro-Hungarian rule. As it is a small and compact city, the contrasts appear more striking. The River Miljacka, running east to west, is the focal point of the city. 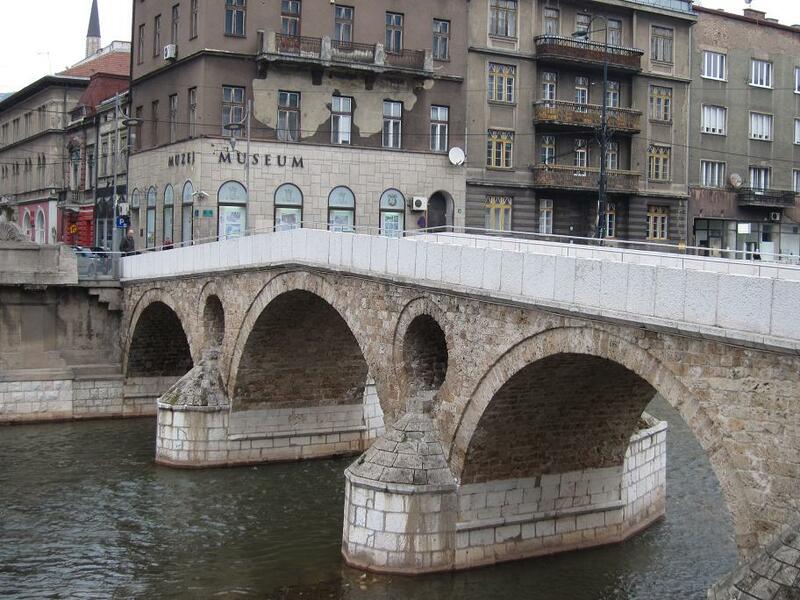 Anyone with even the vaguest sense of history will want to see the 16th century Latin Bridge, site of the assassination of Archduke Franz Ferdinand. There is a small museum on the northern side, showing film footage surrounding the portentous events. Along the river a short distance to the east and there is a building with a rather more amusing history. 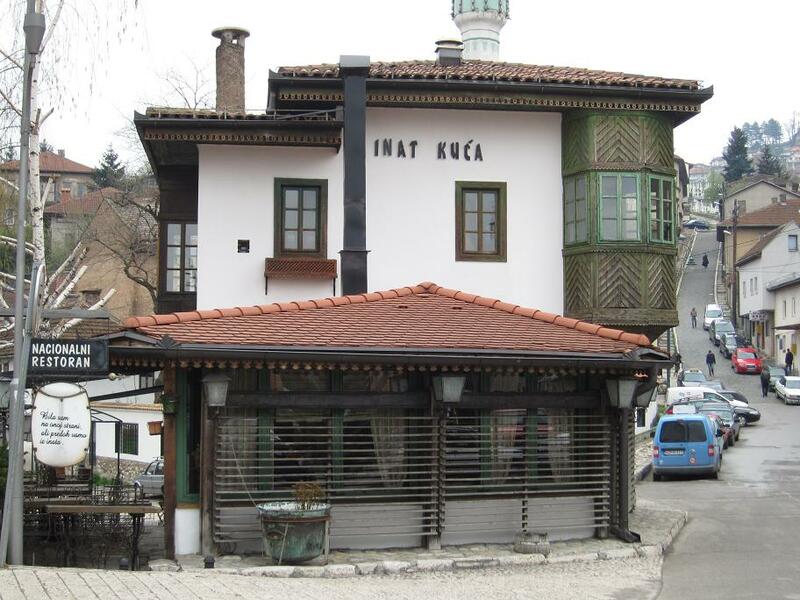 The Inat Kuća (Spite House) is on the south bank, but was once on the other side. When the Austrian administration was sanitising the river, they planned to knock down several houses, but the owner of this residence would only agree if the house was moved, brick by brick, from the northern to the southern bank. Incidentally, the sanitisers must have done a good job, because the water in Sarajevo is exceptionally good. Staying in a delightful guest house (the Ada Hotel) just to the south of the Latin Bridge proved to be an inspired idea. The service is very good, it’s inexpensive and it’s all of ten minutes’ walk from the city centre. Even better, it’s about 200 metres from the Sarajevo Brewery and the excellent bar and restaurant attached to that establishment. The brewery has somewhat legendary status. Certainly, it brews good beer, but its value during the 1992 to 1996 siege was crucial to the survival of the city and its inhabitants. Because the brewery is built on a water source, this was one place that citizens could access clean and safe water. Happily, these days the brewery is back to doing what a brewery should and providing beer. The dark beer (Sarajevsko Tamno) is especially tasty and light enough in strength to act as a session beer. The bar is slightly expensive by Sarajevo standards, but is a thoroughly pleasant place to spend an evening. Sarajevo hosted the 1984 Winter Olympics and there are still legacies of that today. The Olympic Stadium is now home to FK Sarajevo, one of the city’s two major football clubs and to the Bosnian national team. FK Sarajevo’s city rivals, Željezničar, have also played European games at the stadium. For skiers and hikers, the Olympic skiing venues of Bjelašnica and Jahorina are within minutes of Sarajevo and offer a considerably cheaper alternative to the trendy resorts further west. The excellent local bus services will take you to even the remotest mountain villages. There’s no real need to use buses in the city, as it is small and ideal for strolling around. Apart from the hills above the old town, it’s also very flat. It’s worth a tramp up the hills, though, to see the beautifully maintained cemetery at Alifakovac and the view of the city from the hill top. Back at ground level, all of the places of cultural and historical interest are near the centre and the wonderful Viennese coffee house at the Hotel Europe is a perfect place to take a break for a cup of coffee. For those lucky enough not to worry about their waistline, the cakes, strudels and other delicacies are tempting. You can also have a beer there and the Irish coffee is very good, if a little pricy. There are cheaper places to have a drink in Sarajevo, but none more stylish. The National Museum is, in fact, three museums pleasantly situated in a small botanical garden on the northern bank of the Miljacka. 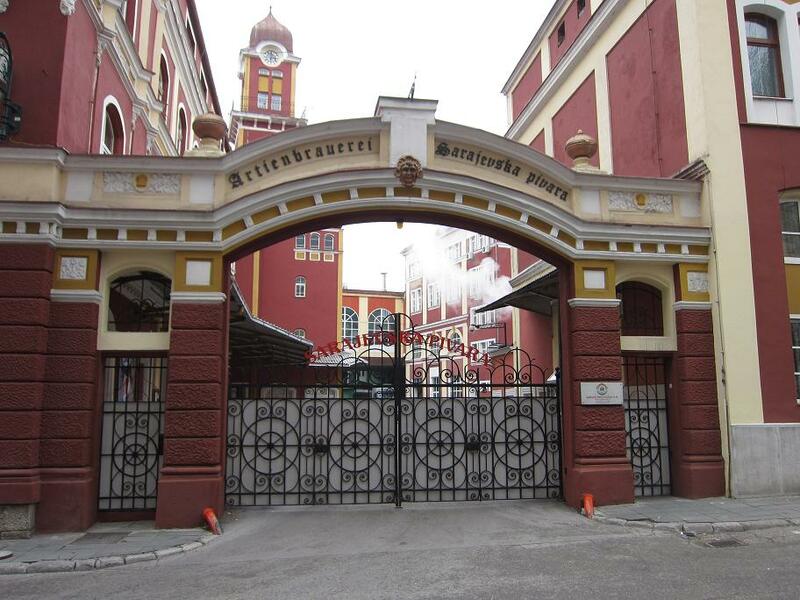 These Austro-Hungarian buildings are worth a view even if you don’t want to see the exhibits. The main museum contains a decent range of archaeological finds and the other museums are dedicated to natural history and ethnography. The last-named is probably the best, but a single, inexpensive ticket allows access to all three and the gardens are a nice place to stroll around and sit for a while. To the north of the museum is one of the few Communist-style buildings, the railway station. It’s a glass and concrete affair, but by the standard of some of the architecture of that era, it’s not too hideous. One thing for train enthusiasts to note is that photography is not allowed at the station. This was probably logical 15 or 20 years ago, but seems a bit pointless now. There are no big parks, but like many cities in the Balkans, there are plenty of green spaces. House sparrows are still a common sight in most towns and cities, but it’s pleasing to note that tree sparrows are abundant in the parks of Sarajevo. Indeed, the city is home to birds such as nuthatches, blackcaps and redpolls alongside the more familiar species. 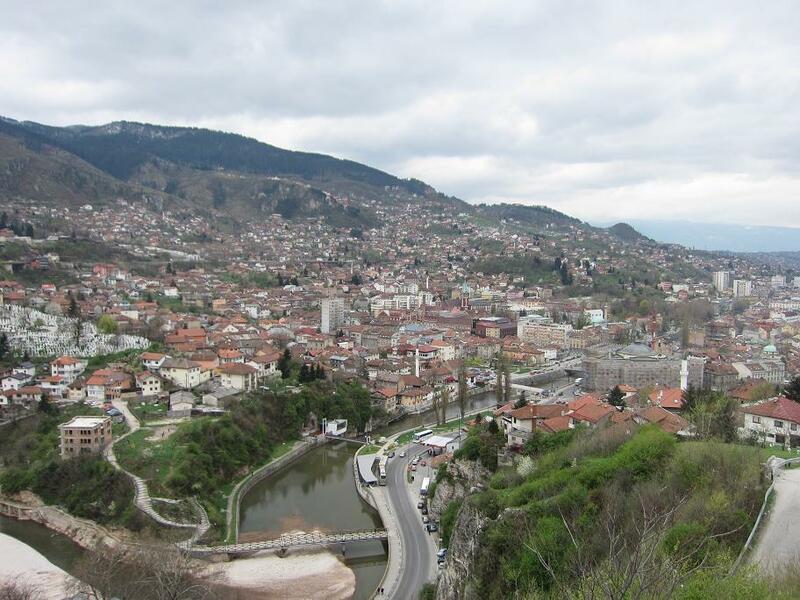 Sarajevo may not be a tourist hotspot, but given its size, that is positively a good thing. It is, though, ideal for a three or four day visit. Visitors are certainly made to feel welcome – Sarajevans always seem delighted that people want to visit their city – and while it’s possible to overspend if you put your mind to it, it’s also very easy to live cheaply. For Sarajevans, simply living peacefully is enough. This entry was tagged Balkans, Bosnia, Sarajevo. Bookmark the permalink.